Daughter and sole heiress of John Beaufort, 1st Duke of Somerset, mother of King Henry VII. Margaret’s first marriage to John de la Pole was arranged while she was a very young and never consummated. Even before their annulment Henry IV had chosen his half-brother Edmund Tudor, 1st Earl of Richmond, son of the king’s mother Catherine of Valois by Owen Tudor to be Margaret’s second husband. Margaret and Edmund were married in 1455, just as the Wars of the Roses was breaking out and Edmund was called into service. Within two years Edmund was dead and Margaret, after experiencing an extremely difficult delivery, was a widow with a young son. With England a nation in civil war Margaret decided to leave court and return to Pembroke Castle in Wales where she believed her son would be safe since he was the grandson of Owen Tudor, a descendant of the native princes in Wales. In 1458, Margaret married her third husband, second cousin Sir Henry Stafford, enjoying a harmonious marital relationship until his death in 1471, no issue. The following year she married her fourth husband, Thomas Stanley whose political position enabled her to return to the court of Edward IV, becoming a very close companion to queen Elizabeth Woodville. ​Edward died in 1483 and his brother Richard seized the throne followed with an act by parliament to strip Margaret of all her titles and estates in retaliation against her actively promoting her son as an alternative including marriage plans between her son Henry and Edward’s daughter. Margaret using remarkable determination orchestrated this marriage arrangement and on Christmas Day 1483, Rennes Cathedral Henry pledged to marry Elizabeth of York, the eldest daughter of Edward IV and Elizabeth Woodville. August 1485, at the Battle of Bosworth Field, the last significant battle of the Wars of the Roses, king Richard was killed and Henry won the English crown as Henry VII becoming the first monarch of the House of Tudor. 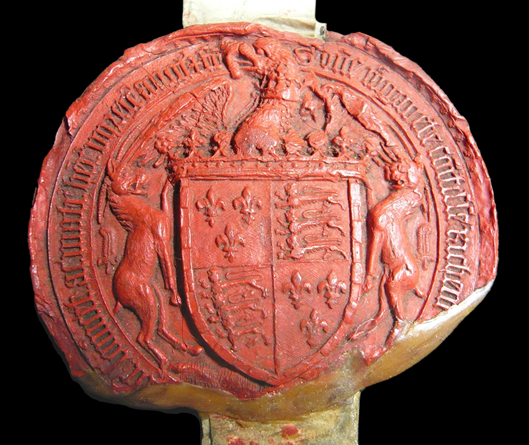 Seal of Lady Margaret Beaufort, St. John's College, Cambridge Archives, D5.13, By permission of the Master and Fellows of St. John's College, Cambridge. Henry VII was devoted to his mother and allowed her to exert considerable influence. During Henry’s first parliament he recognized Margaret’s right to hold property independently, to be referred to in court as “My Lady the King’s Mother” followed later with a special commission for her to administer justice in the north of England. “Margaret Beaufort” Jones, Michael. History Today, Volume 35 Issue 8 August 1985 //www.historytoday.com/michael-jones/lady-margaret-beaufort. “MARGARET Beaufort.” Foundation for Medieval Genealogy. ENGLAND, KINGS 1066-1603, Chapter 3. KINGS OF ENGLAND 1154-1485 (ANJOU) E. BEAUFORT, a) MARGARET Beaufort. Web 08 October 2016. //fmg.ac/Projects/MedLands/ENGLAND,%20Kings%201066-1603.htm. Richardson, Douglas. Royal Ancestry: A Study in Colonial and Medieval Families. vol. 5 pp 203.13. 2013. Jones, Michael K. and Malcolm G. Underwood, The King's Mother, Lady Margaret Beaufort Countess of Richmond and Derby, Cambridge Press, 1993.